The surprisingly part is how fast this made onto the news. Hotta-san and Yoneya-san sat down with the reporters at 5:30pm after the Internet Telephony track and we saw the report at 9:00pm. 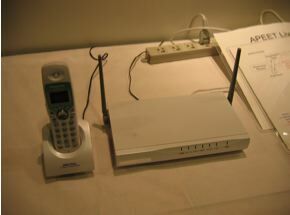 Then spend the whole day chairing the Internet Telephony track at APRICOT. Richard already blogged about it so I won’t repeat here. Went to lunch with Dave Crocker who is trying to explain CSV (smtp authentication and accreditation) idea to me on antispam. Neat idea. Started early and have breakfast with Marc Blanchet, the former co-chair of IDN WG with me. Anyway, Marc is back doing IPv6 and his small startup in Canada is doing great – expanding their business in Asia. The spend most of the day at the APRICOT AC meeting, listening to the various presentation from the bidders of APRICOT 2007. All of them are interesting and it is a difficult decision (no leak here, of cos). Then I went over to the APDIP Internet Governance; I hope I didn’t say anything stupid or gets into trouble for what I said. I suppose it is always a possibility and someone somewhere isn’t happy with what I say. 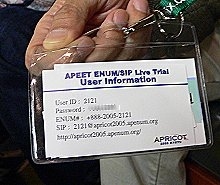 Immediately, after the APDIP panel, I have to rush to the APEET BoF. The trial we were doing got so much interests that many people have been asking us to do a BoF to talk about how we did it, how it works, what else can they do with the phones and the ENUM service we provide. Have breakfast at Suguru Yamaguchi. 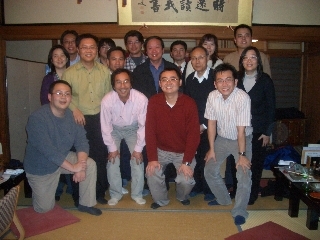 I know him when he is still a “young” professor many years ago but now, he is the IT Security Advisor to the Japan Cabinet and Prime Minister. Wow very important person now! Anyway, have a little discussion with him on privacy and asked him to hook up with Joi. 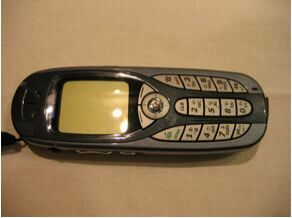 Gave out SIP phones in the morning and wandering excitably around the hall talking to people about their phones. In fact, we run out of phones by noon time, and APRICOT haven’t even started. Another great news is we got US (thanks Jeff and Libretel) and SE (thanks to Jakob) gateway up in addition to CN, TW and SG. We got so much interest that we going to do an impromptu BoF tomorrow. Got Joi to speak about blogging at APNG (phew, wiggled out of that :-) and really enjoy his talk! Banged into Steve Crocker and have lunch with him. Then Toru Takahashi, Randy Bush and Geoff Hutson joined us. While Steve is showing me his file collobration tool, Randy is knocking me to get the SIP phone working with his Asterisk. Just finish listening to Jun Murai keynote and sitting at APNG to get a bit of peace and quiet…Need to spend the next few hours doing my keynote on Thrusday on VoIP. 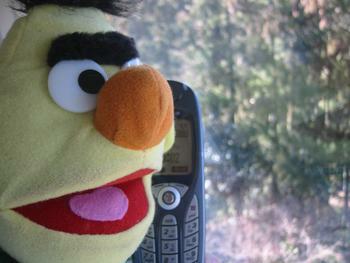 Oh yea, the famous Bert was spotted in APRICOT. But I think he spent too much time in the toilet. ha ha! 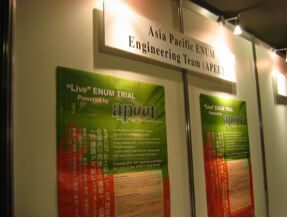 Singapore, July 19, 2004 – [CNNIC] (China Network Information Center), [JPRS] (Japan Registry Service), [KRNIC] (Korea Network Information Center), [SGNIC] (Singapore Network Information Center) and [TWNIC] (Taiwan Network Information Center) today announced the formation of Asia Pacific ENUM Engineering Team (APEET), an informal technical project team formed to coordinate and synergize ENUM activities in the Asia Pacific region. 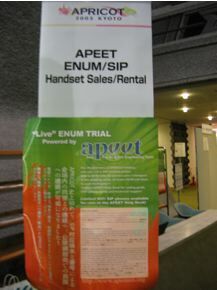 Just concluded a successful APEET meeting in Singapore (thanks you!) and I am getting to leave for Kuala Lumpur in 10mins time. But before I leave, I thought of leaving two interesting news I saw today. First, is a report of Verisign SiteFinder by Steve Crocker (a representive of Security and Stability Advisory Committee of ICANN) titled Redirection in the COM and NET Domains, A Report from the ICANN Security and Stability Advisory Committee (SSAC). An executive summary of the report can be found at CircleID. Bravo! Bravo! I taken the same position which you can read here, here and here.